To large shipbuilders, we can be the single source for all labeling needs for all ships being built to serve the militaries across North America, which we will produce and deliver on time, accurately, and to your exact specifications. We offer flexible volume pricing for fleet contracts, and by choosing to consolidate your labeling needs to us, you are choosing experience, saving your time and budget, and receiving a team dedicated to producing your project to completion. Showcasing the most frequently purchased products by leaders in the Marine Industry. Our photo-luminescent marine signs are available in self-adhesive flexible vinyl or rigid plastic. We specialize in the knowledge and expertise required to provide our customers with a superior, high quality signage system designed to comply and serve the requirements of the Marine Industry. This high performance signage utilizes proven materials which are designed to withstand the harsh marine environment, including winds in excess of 120 miles per hour. The photo-luminescent materials are comprised of patented pigments that are type approved to meet the regulations set forth by IMO/SOLAS, APTA and ASTM. Our retroreflective photoluminescent signs are a multi-substrate, multi-process product. We start with 3M™ Diamond Grade™ DG³ Reflective Sheeting Series 4000, which comes in a variety of color options and offers superior reflectivity at short and long distances. Once cut, we apply the DG³ to die cut 3M™ Luminous Film 6900, which is a high performance luminous film primarily used for interior luminous signs and markings, including safety signage in buildings, ships, ferries, and railroads. This 3M™ Photoluminescent Tape is utilized in US Navy ships. Because of it’s superior initial and retained photoluminosity, this tape increases visibility of markigns and signage in dark and low-light conditions. It requires no additional electrical power and will continue to glow in the event of an electrical failure. Meets NAVSEA specifications, and is available in 1 inch x 50 yard rolls. This high performance photoluminescent film is rechargeable “glow in the dark” and is used for the production of safety and emergency exit signage. 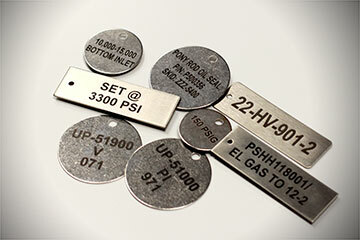 The majority of our laser etched machinery tags are manufactured from 16 gauge, .062″ thick grade 316 stainless steel and can be welded to your equipment or we can drill holes to allow the tag to be attached with screws or rivets. We also offer 20 gauge, .038″ thick grade 304 in some sizes. 3M™ 471 Striped Floor Marking Tape comes in either 2 inch x 108 inch or 3 inch x 108 inch rolls, and either black/white or yellow/white stripes. This tape is perfect for keeping your indoor working areas organized and aisles clear. Mid-shore Patrol Vessel Project was a series of nine patrol boats constructed by Halifax shipyard for the Canadian Coast Guard. AGE furnished marcher tags, valve tags, and safety signage in dual language English/French for the nine ship project. For 16 years, Advanced Graphic Engraving manufactured engraved signs and tags for vessels constructed by Leevac Industries. Advanced Graphic Engraving manufactured the signs and tags for five newly constructed, high technology, 300 foot offshore work boats. 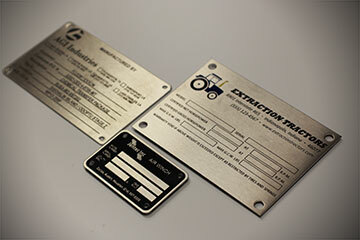 Since 2006, Advanced Graphic Engraving has provided safety signs for shipbuilding and repairs. Here is what our Marine customers have to say about our work. I am so proud of your company, need more like this, thanks, E.J.